Beginning life in 1992, this Windy City force came together when Ricks' Yifrach and McCoy as well as a host of others took their love for atmosphere, melody, and metal, creating something akin to the early releases put forth by their European counterparts such as old Paradise Lost, and even took influence from artists like Dead Can Dance,Loreena MacKennit,and Cranes. 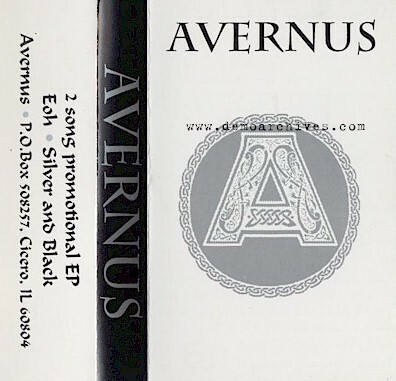 AVERNUS debuted with the 1993 demo tape ‘A Delicate Tracery Of Red’ followed by further sessions 'Anastasia' and ‘Sadness’, both during 1994. Kim Goss exited for Scandinavia during 1995 and was in bands such as Therion, Sinergy, and Ancient. 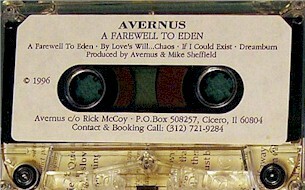 A third demo outing, ‘A Farewell To Eden’ in 1996, led to the first AVERNUS album ‘Of The Fallen’ for Olympic Records. Pro made covers. 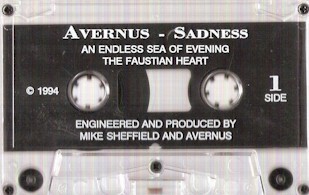 Pro printed red cassettes. Has Lyrics. Pro made covers. 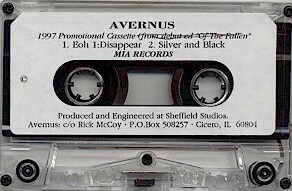 Tapes were the studio tapes but with a sticker on the shell. Lyrics included. Pro made covers. 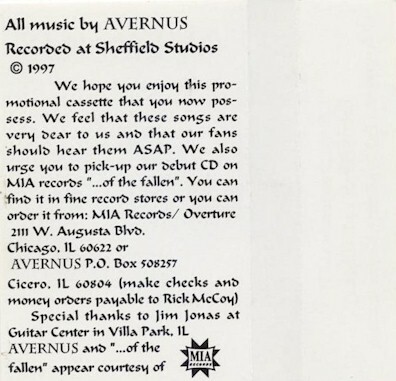 Recorded on studio tapes with a sticker on the shell. No lyrics. This was given away for FREE by mail or concerts!